Northern Ireland Under 15 boss Desi Curry has named a 19-man squad for the Invitation International against Malta U16s at the Newry Showgrounds on Friday night (6pm). Curry is looking forward to his young side taking on top class opposition. 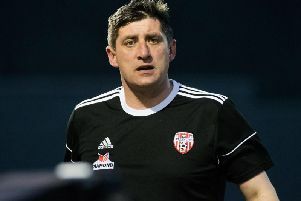 “Malta will host the UEFA Under 17 Elite Tournament next year and the Malta FA has been keen to ensure that the team is well prepared,” he said. “They have been together for over a year and have played a number of international games.They recently played a strong Austrian team and lost narrowly 3-1 and 2-0. This is the first visit of Malta to Northern Ireland and we expect a tight match. “It is vital that the players get lots of experience at international level at a young age if they are to progress through the ranks to the senior team” added Curry.